Let us start from what is most obvious, glancing over a page randomly chosen from the Epistle Lectionary (Fig.1a). Its border is typically Flemish, displaying an enchanting array of delicately painted flowers, leaves, butterflies and birds on an ochre ground. 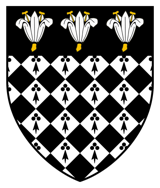 Most striking within the framework of the border is the obsessive repetition of the heraldic insignia of the man who had the power, money and vision to commission the books. The arms embedded in the very structure of the manuscripts provide precise visual imagery directing us to the figure behind. In this case we are in the presence of elements chosen for their relevance in relation to Thomas Wolsey (c.1470-1530). 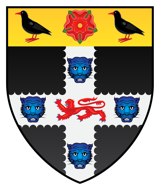 As the ultimate aim of heraldry was personal identification, there is no doubt, he wanted to be known. 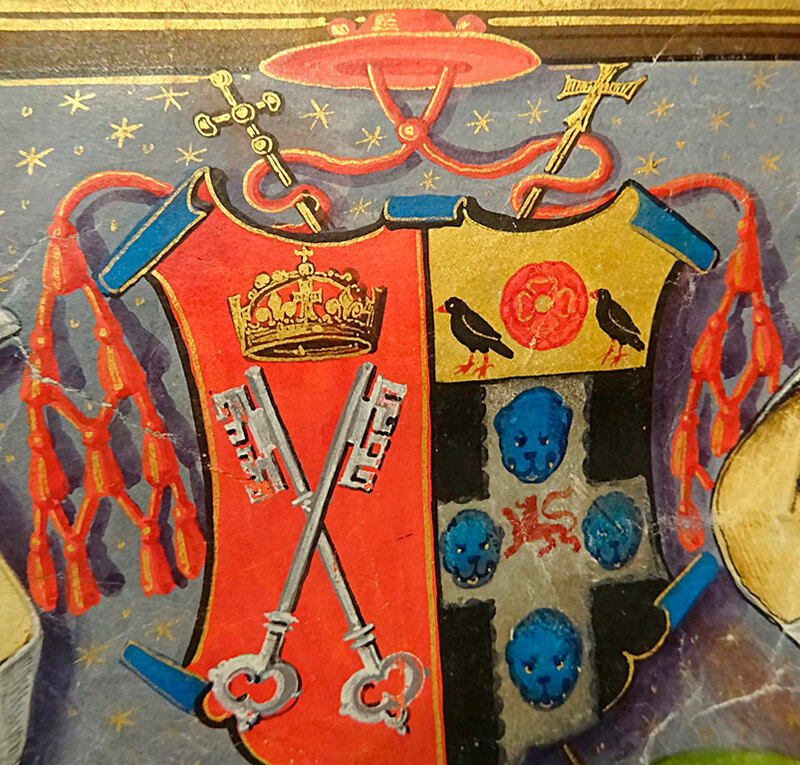 There is also no doubt, these were very special volumes for the cardinal. Beautiful and important, they were meant to carry his signature. They were to be recognized by everybody who had eyes to see as part of his legacy. For an ambitious man like Wolsey, legacy was crucial and these volumes alone would suffice to demonstrate his enthusiasm for books, his superlative taste and the ability to engage the services of the finest scribes and manuscript illuminators in Europe. In contrast, of those who created the manuscripts, surprisingly little is known for sure. Their names do not appear on any of the pages, so we have to look for other clues. As we have just heard from David, the calligrapher was Pieter Meghen1. Identifying him is relatively easy, as his bold upright hand is immediately recognizable to scholars. Identifying the illuminator is a real challenge though. 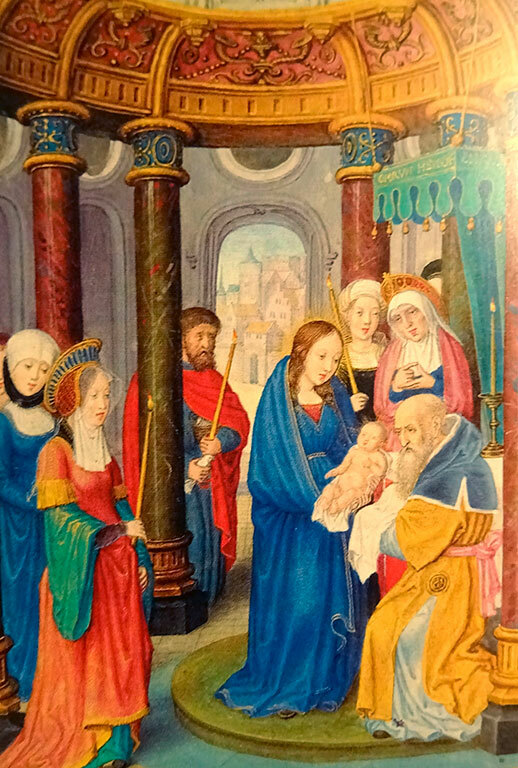 To start with, the miniatures have been attributed to Gerard Horenbout2. This however has been recently reconsidered and the author has for a while been quoted as the 'Master of Cardinal Wolsey'3. The style points to the Ghent-Bruges school of illumination. The manuscript provides plenty of data to be sure of this, with the border beginning to convey a spatial illusion independent of other decoration on the page. 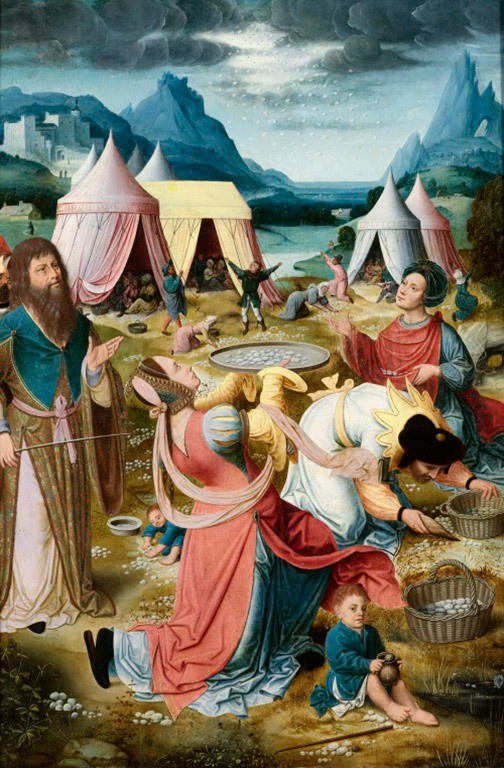 The technique was imported from Flemish painters like Jan van Eyck, Cornelis Massys, Pieter Bruegel the Elder and Joachim Patinir, painters who brought an extraordinary veracity in their work. 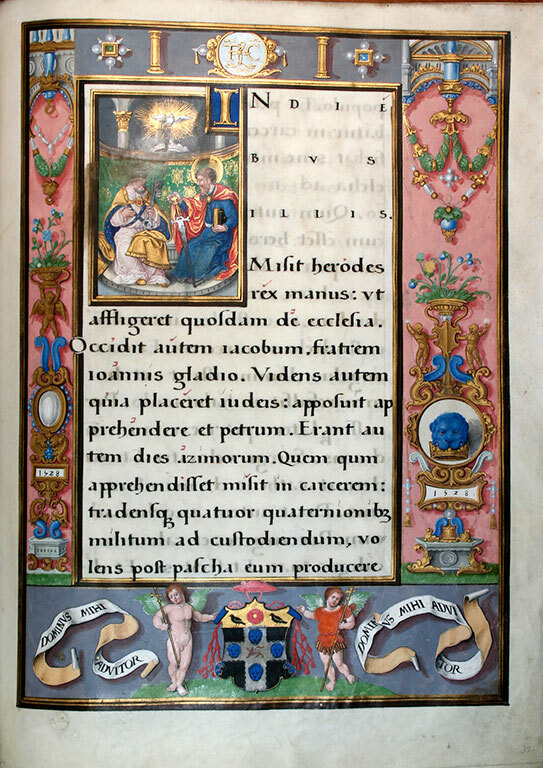 By the mid-1470s, illuminators introduced the same verisimilitude adapting the technique to the medium of the book. A hallmark of late Flemish illumination is a border decorated with all the traditional elements, where each motif casts a shadow on a coloured ground. The illusion thus created is perfect. Surfaces appear tangible, real, inviting us to connect. This suggests a manifest desire of the artist for greater involvement on the part of the viewer. One is, in effect, asked not only to look, but breathe with the picture, partake of the same experience, enter the game, learn to read its subtleties of tone, composition and meaning. While the border provides the feeling of an intimate, accessible reality, the miniature, in contrast, suggests the very opposite, playing with complex narratives and vast spaces. Landscape imagery, for instance, was very much used in this particular period. The miniature for the feast of Corpus Christi in the Epistle Lectionary is a good example (Fig.1a). One can immediately recognize this as a Flemish manuscript by simply looking at how landscape is represented. Colour-coding helps a sense of recession, from the warmest of tones (browns and reds) in the foreground, through a middle-ground of green, to a cool background of blue and grey. Typically, horizons are high so that the viewer mounts up the picture to go back in space. Moreover, in this, as well as in other miniatures of the Lectionary, the natural world is depicted in such a way as to stress narrative purpose. Here the story is that of Manna falling from Heaven, as described in the Book of Exodus (16,1-36), where manna appears as a fine, flake-like substance, looking similar to frost on the ground. While not exceedingly popular, the theme surfaces now and again in painting. 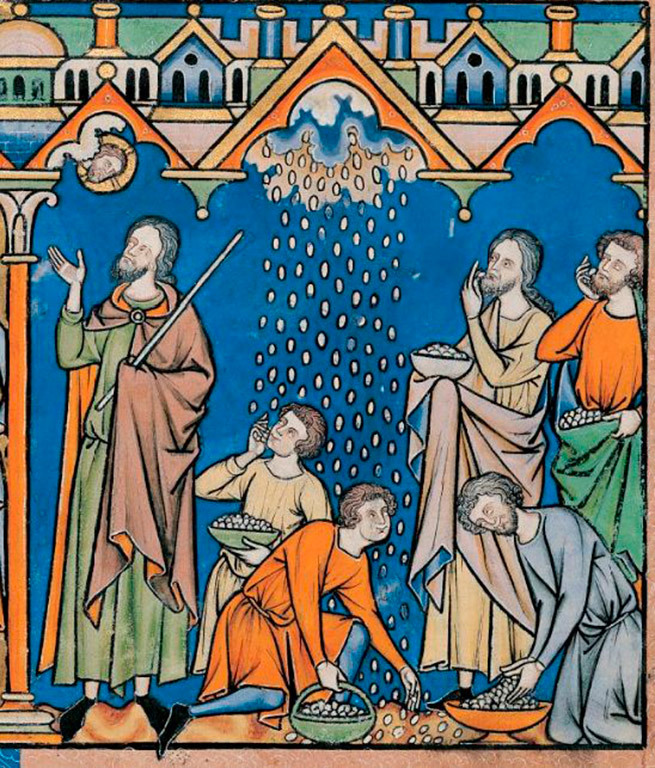 Compared with the iconic illustration in the medieval manuscript (Fig.1b), where six men under a man-made architectural canopy are snowed down with manna falling from a small, bi-dimensional, landscape-free cloud, the Flemish images (Fig.1c,d,e) are distinctly different. They also share key elements between themselves: the presence of several richly-dressed men and women gathering the manna and the turbulent, heavy clouds looming over an equally majestic nature. There are obvious similarities of composition and tonal range (especially between Fig.1a and Fig.1e), but the experience of an all-embracing, panoramic landscape, where everything is harmoniously integrated in a picture emulating three-dimensionality, is nowhere as dramatic as in the miniature in the Epistle Lectionary. This shows the hand of a master illuminator at work. The choice of the Biblical narrative for the feast of Corpus Christi is meant to further engage the reader and place the image in direct and subtle relationship with the text. In both the Gospel and the Epistle Lectionary, the readings are touching on the theme of the Last Supper and the transubstantiation of bread and wine: John, 6,56-59 and 1 Corinthiens 11, 23-29, respectively. However, only in the Gospel Lectionary the miniature is a representation of the Last Supper. This, in a context in which, in most cases throughout the manuscripts, miniatures tend to be variations of the same image for each feast. Not in this case! The text in the Epistolary, while talking about transubstantiation, focuses on men not being able to recognize the divine element behind the transformation. Looking carefully at the miniature encapsulating the manna narrative, the skies do open in all their splendour, but God remains invisible behind the thick clouds. Not so, in the illustration chosen for the other manuscript, where Christ is in the middle of the crowd. Incidentally, both miniatures depict the same number of people: eleven! 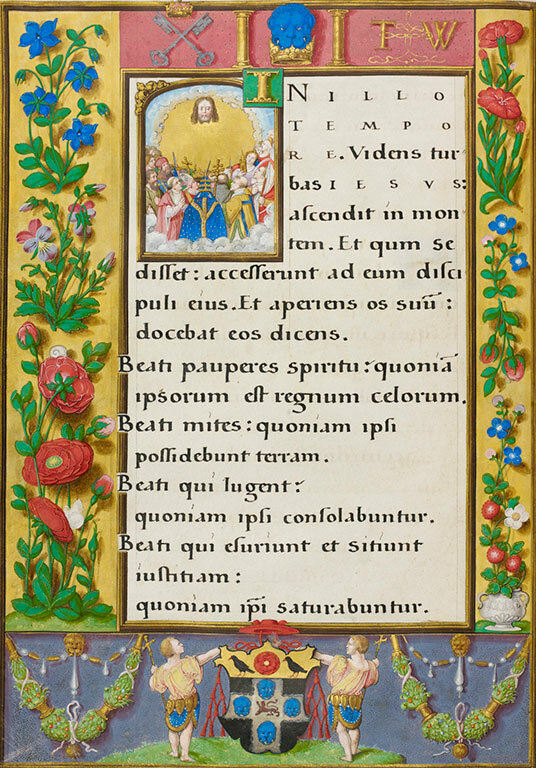 This might be a simple accident, but it also might be intentional, thus making not only image and text relate to each other, but also placing the two miniatures illustrating the same feast in direct connection, thus bringing the two parts of the lectionary together and inviting the reader to view the manuscript as a whole. 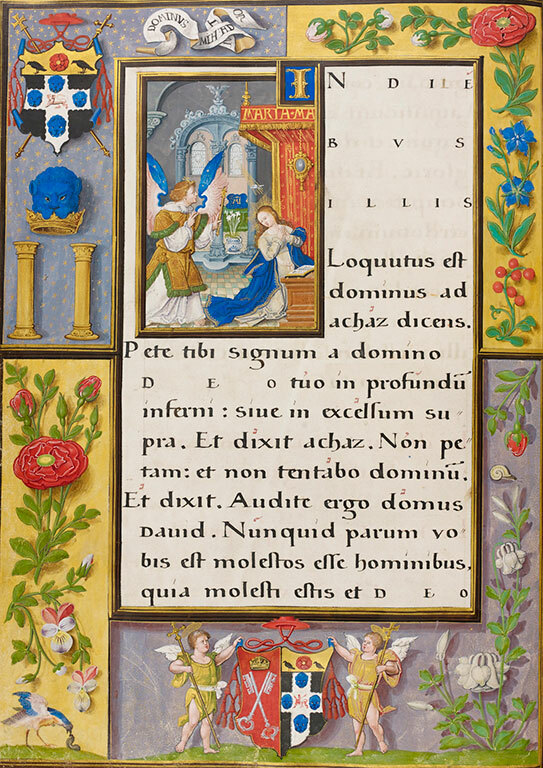 Looking at the set of miniatures painted on the pages of the two Lectionaries one is bound to notice that they are simultaneously standardised and unique. As expected, in relation to the readings for various feasts, there are several images of the seated, standing or enthroned Madonnas, traditional scenes from Christ’s life, unsurprising representations of saints, all in rather theatrical sets, often heavy with rich and colourful fabrics and expensive furniture. Once in a while, models are followed so literally they feel more like quotations rather than variations on a theme. This is the case of quite a few miniatures. 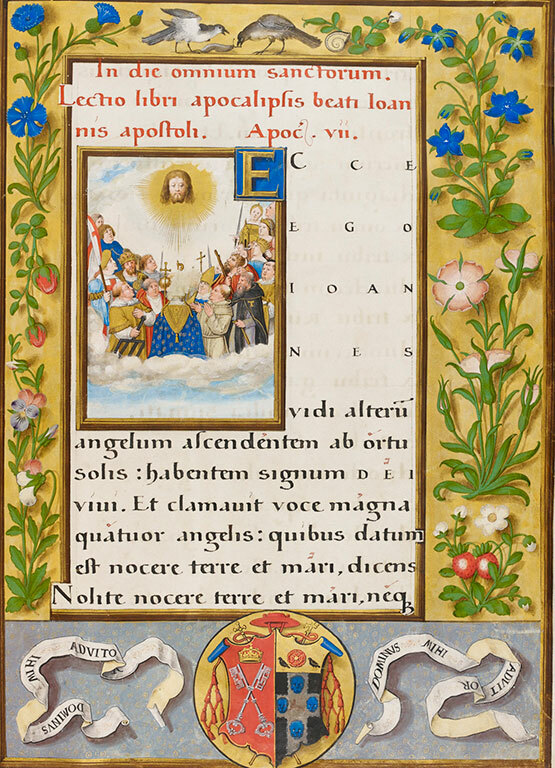 To be specific, those for the feasts of the Annunciation in both manuscripts, Easter Sunday, with two different images for the Epistle and Gospel Lectionary, Ascension in the Epistolary, Pentecost in both manuscripts, and the ‘Last Supper’ for the feast of Corpus Christi in the Gospel Lectionary. 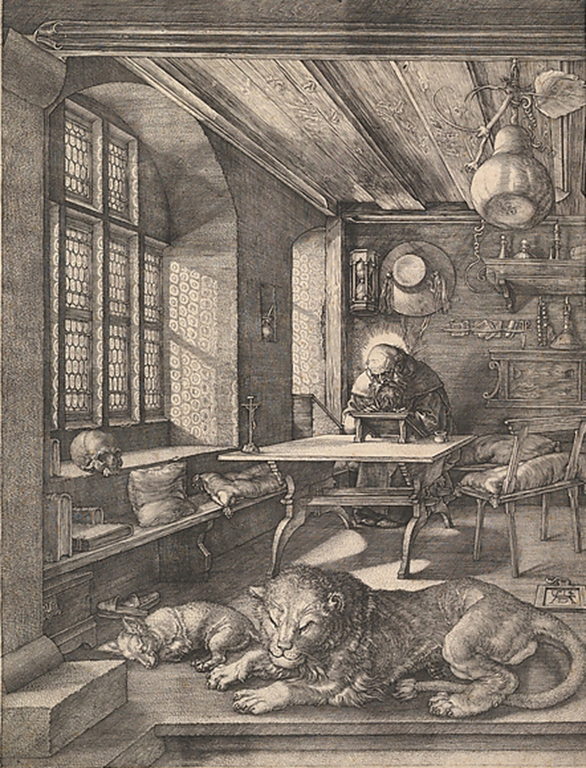 The direct source for all these is Albrecht Dürer. Looking at Dürer’s woodcuts, especially in his Small Passion, it is easy to see how closely the miniatures mirror them. No surprise here. The impact Dürer had upon his contemporaries was immensely wide-ranging. The painter contributed to it himself. He travelled widely. His trip to the Low Countries for example, the meetings with other artists, the honours he received and the works (a significant range of his prints mostly) he gave away are well-documented by Dürer himself in his Diary of the Journey to the Netherlands (1520-1521). There is no doubt to what extent his style was absorbed by leading artists and print-makers of his generation who either knew him or his work first hand. This not under dispute. The question, in connection to the manuscripts under discussion, is whether there are any significant departures from the Dürer template and if these leave any room for commentary on the part of the illuminator with regard to the commission he received on the one hand, and the model he chose on the other. 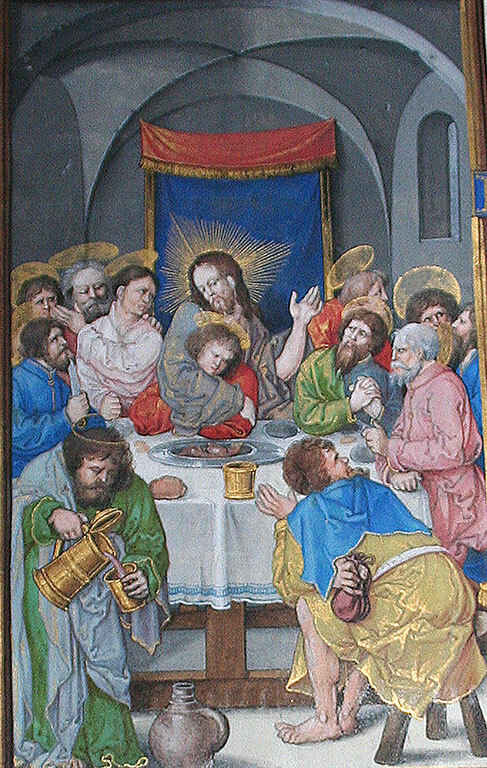 If we look at the ‘Last Supper’ (Fig.2a), Dürer’s composition, with the vaulted ceiling trimmed off on the sides, serves to create an optical illusion, widening the chamber. The figures around the table are arranged in a manner to allow an unobstructed view of the centre. The interior is further opened by the presence of the round, almost halo-like window, hovering above Christ’s head. The miniature (Fig.2b), on the other hand, replicates the room, but the space feels different. Instead of the window we have a dark blue cloth interposed between the wall and the people around the table. It is a crowded, uneasy scene, the narrative of which is told (like in the original) through a complex series of hand gestures. In spite of obvious similarities, the miniature does not copy the model. It actually tells a different story. There is a reason why space feels different, more claustrophobic, in the illumination. 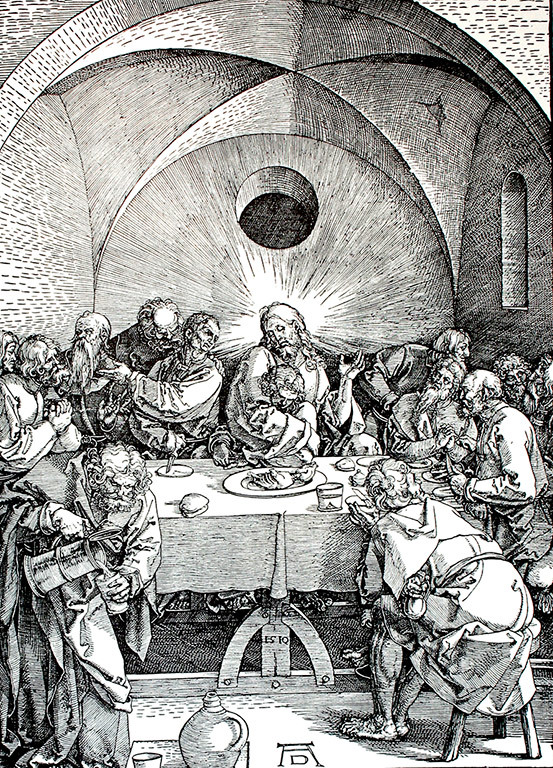 Dürer’s account of the Last Supper includes a thirteenth person. 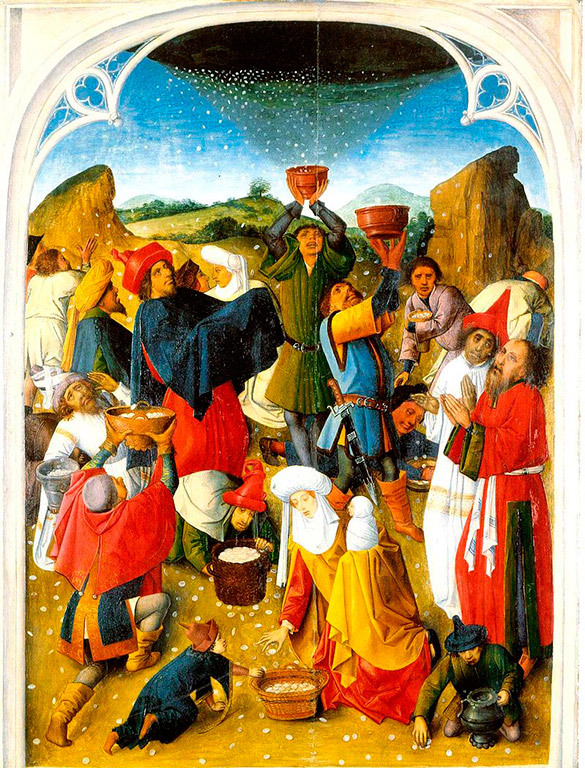 Apart from Christ and the twelve apostles, there is, on the left, in the foreground, a man (mentioned in Luke 22:10) carrying a pitcher of wine. The presence of someone outside the inner circle around Jesus, has been transposed compositionally by a visible widening of the space, an openness of sorts. How different the reading of the same scene is in the manuscript! 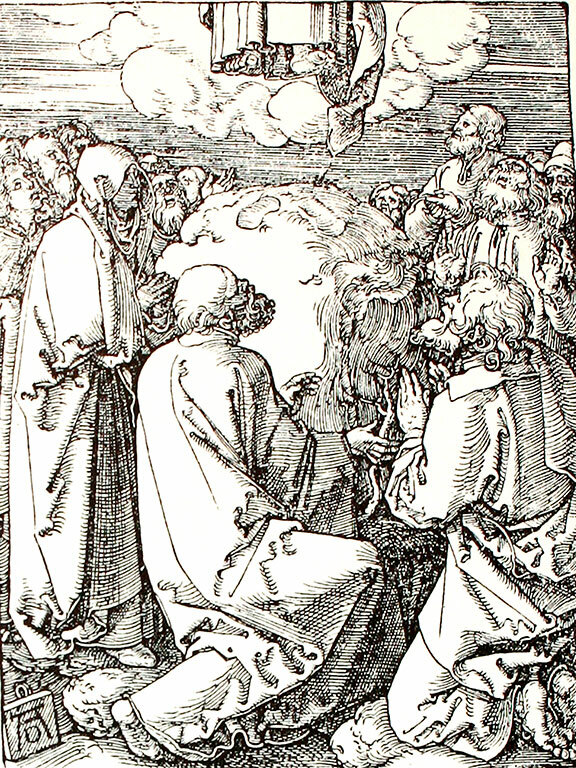 Although at first sight, the character pouring wine is copied across form Dürer’s woodcut, on the whole, there is one figure less, which makes the man holding the jug one of the apostles. This change of role is also emphasized by the presence of the halo over his head. And with it, a distinct sign of the illuminator’s own input. Barely noticeable, it is nevertheless a difference that sets the two scenes apart. With very few touches and apparently following a model to the letter, the manuscript, in effect, asserts its own voice. In the case of another very close match, that of Dürer’s Ascension (Fig.3a), it is not as much the minute differences, but the striking nature of the composition that attracts attention. We have a crowd surrounding a pair of footprints and a character taking off. We only see the bottom of his robe and his bare feet. As to the rest, what is not contained within the limits of the picture, we are to fill-in by ourselves. The choice of a source such as this is in perfect harmony with the Flemish illuminator’s desire to engage his viewers, inviting them in, tempting them with a puzzle. 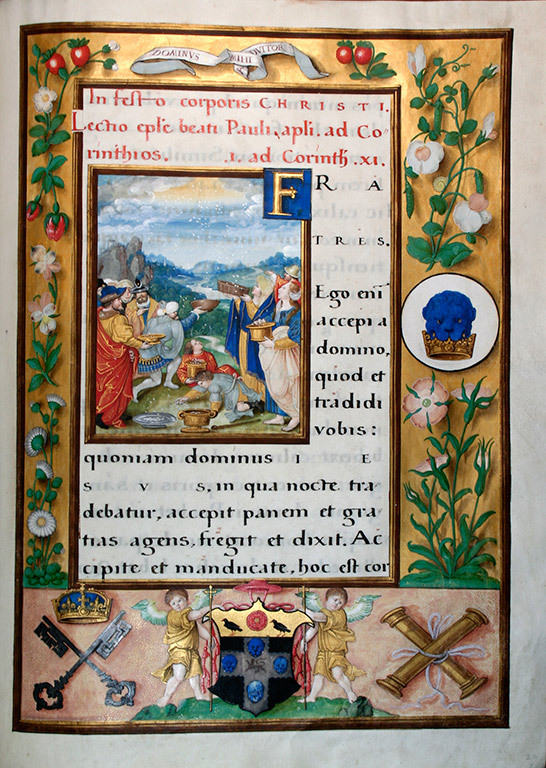 The whole page of the manuscript (Fig.3b) is a puzzle, as it is the only one where, instead of just Wolsey’s insignia, we are also faced with the royal arms, the griffin and the newly introduced lion (instead of greyhound) as supporters. The striking and unexpected nature of the decoration is meant to attract attention. We are not quite sure what exactly we should focus on. There are so many possible clues: the significance of Henry’s symbolic presence, the feast as such, the date. One of the most obvious routes to take is to relate the king’s arms to the red carnations. This page in particular puts them in the foreground. 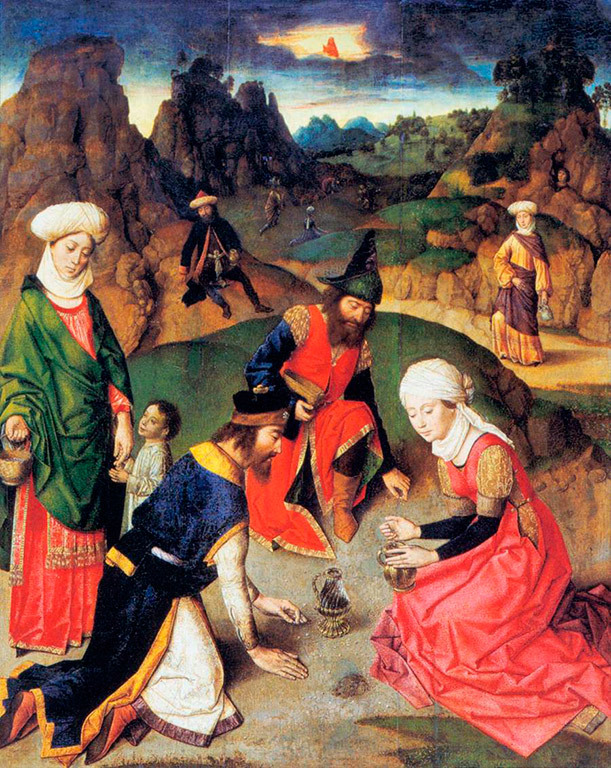 In Flemish painting they are a recognizable symbol of betrothal. In portraits, for instance, whenever held in the sitter’s hand, carnations are a sign of a person’s engagement4. If we are to extrapolate, remembering that 1528 (a date inscribed on the border of the page for the feast of St Peter and St Paul in the Epistolary) was the year when Henry’s intentions to marry Anne Boleyn became increasingly clear, then the page can be read as Wolsey’s silent acknowledgement of her unstoppable ascension. These two intensely decorated pages (Fig.3b and Fig.4a) are particularly revealing if one focuses on the border from a palaeographical point of view. David Rundle was the first to notice the formation of the numbers in the date as it surfaces on fol.32r in MS 101 and the date in a royal charter for Cardinal College (E24/20/2) (Fig.4b). 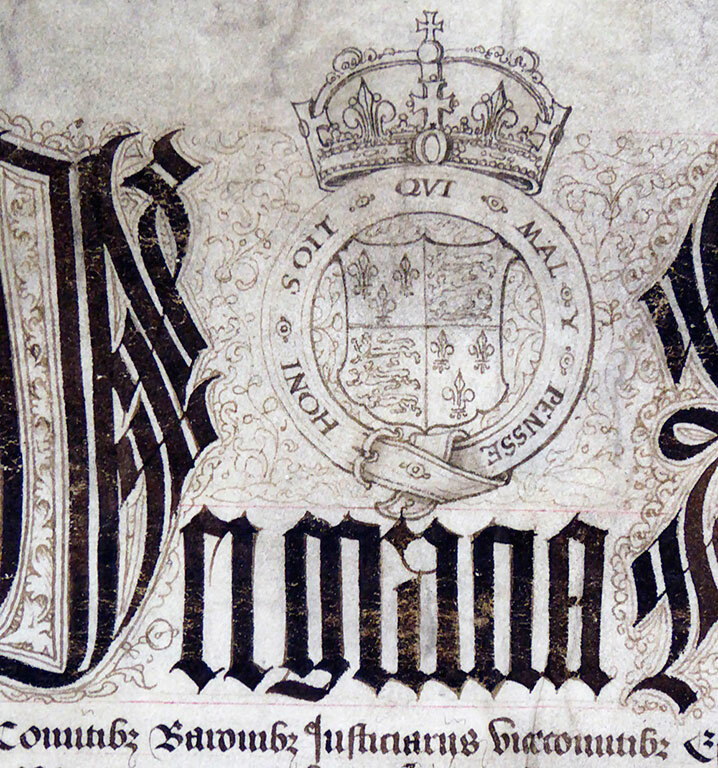 Add to this the obvious similarities in the script carrying the words "Honi soit qui mal y pense", the motto of the Order of the Garter, surrounding the King's arms on fol.20r of MS 101, Wolsey's arms on no less than five borders of MS 223 and another royal charter for Cardinal College (Fig.4c). Also compare the way the crown is drawn in MS 101 and the charter. All these elements suggest the same artist. 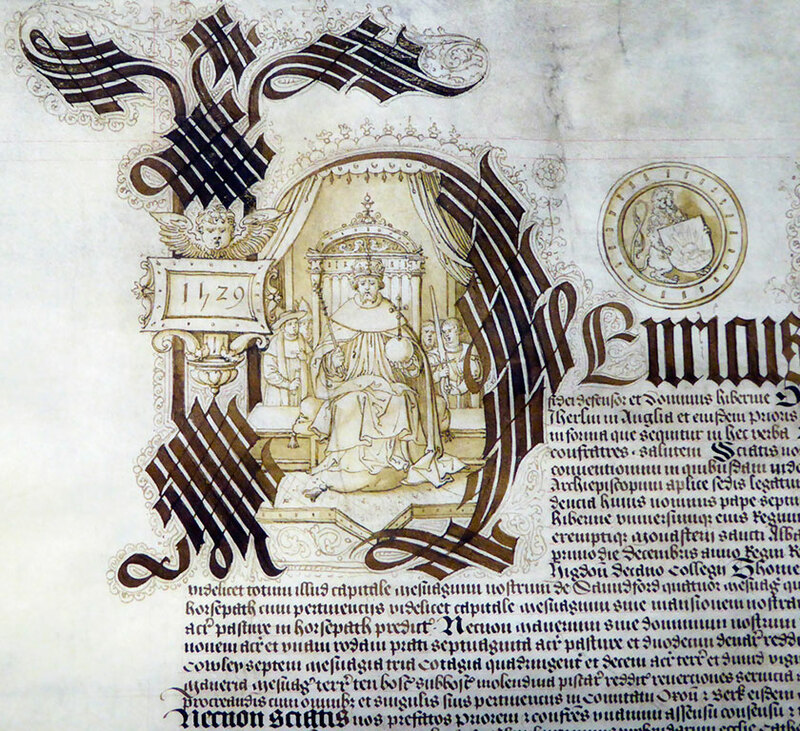 The charter is memorable through the exquisite image of the king in the capital letter H. A similar-looking historiated initial appears in two other charters: the 1526 for Cardinal College (E24/6/1) and 1529 for Ipswich College (E.24/2/1). 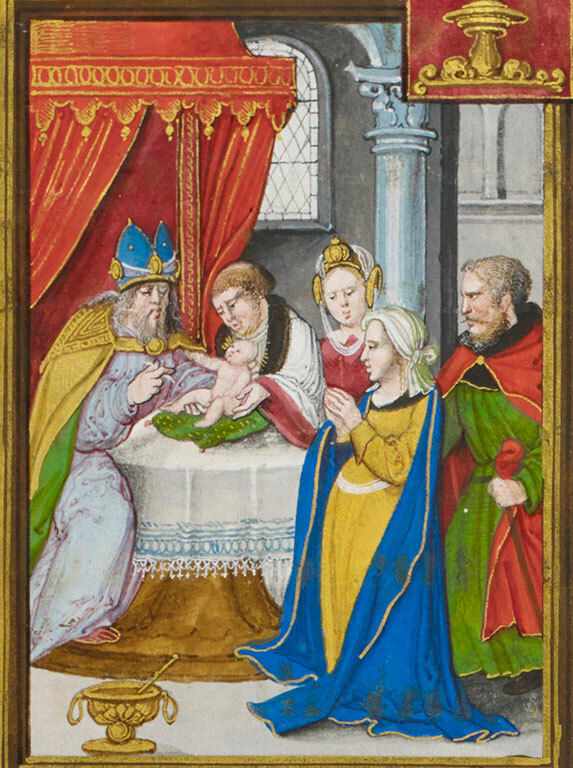 All three grisaille miniatures are outstanding in quality and the consensus5 is that the likely author was a member of the Horenbout family, possibly Lucas. Furthermore, if we are looking for common features between the Wolsey Lectionaries and other manuscripts, let us focus on the opening page for the feast of the Epiphany (Fig.5a) in the Epistolary and the Hatfield House MS 324, containing the Acts of the Apostles and the Apocalypse (Fig.5b). The borders are eerily close in style. 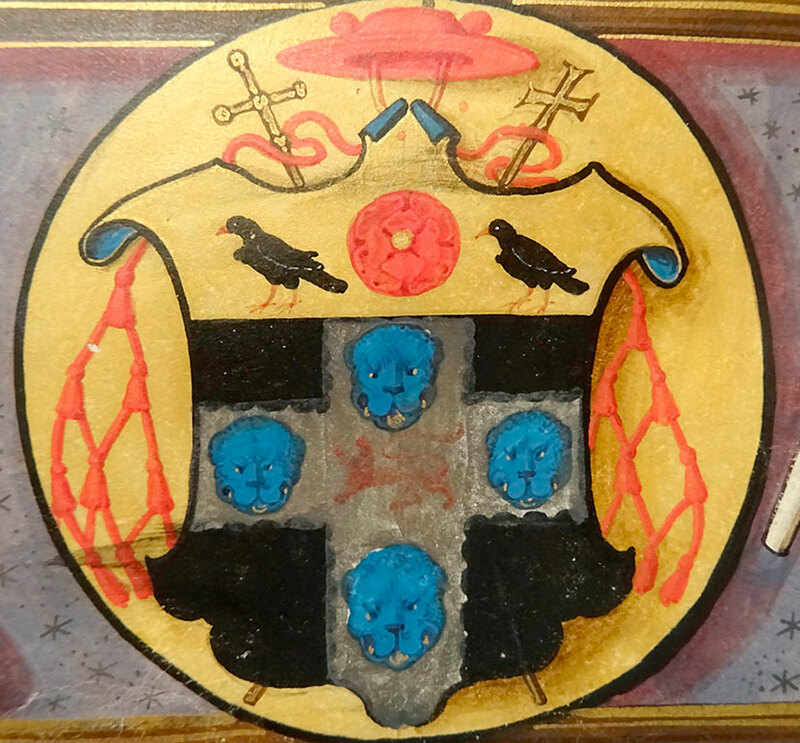 The same composition highlighting flowers, fruits and butterflies, the same tonal range and a similar arrangement for the arms and badges of those who commissioned the manuscripts, Thomas Wolsey, and Henry VIII, respectively. 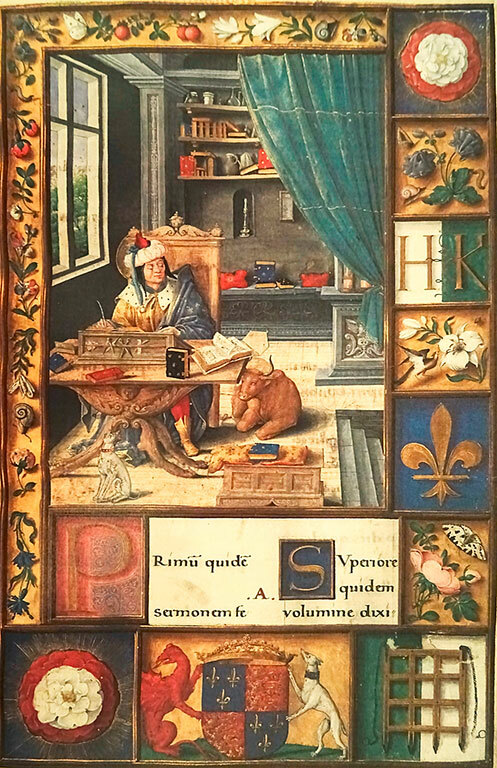 The scribe is the same Pieter Meghen and the miniatures, although different in size, share important features. The drapery folds in a similar way and the fabrics, heavy and laced with gold, give an air of opulence to the picture. If we compare the image in the Hatfield manuscripts with other miniatures in the Lectionaries we will find more common ground. The way rooms are furnished, for instance, down to details such as a penchant for colourful, embroidered cushions, also hints at the same hand or workshop being involved in the making of these manuscripts. For this, we needn't look further than at the miniature for the Annunciation in the Christ Church Epistolary (Fig.5c). Apart from the sense of comfort and warmth rendered to the viewer by the rich fabrics depicted, casting an eye to the floor, we notice the tiles are arranged in roughly the same way and occupy the same amount of space in the picture. 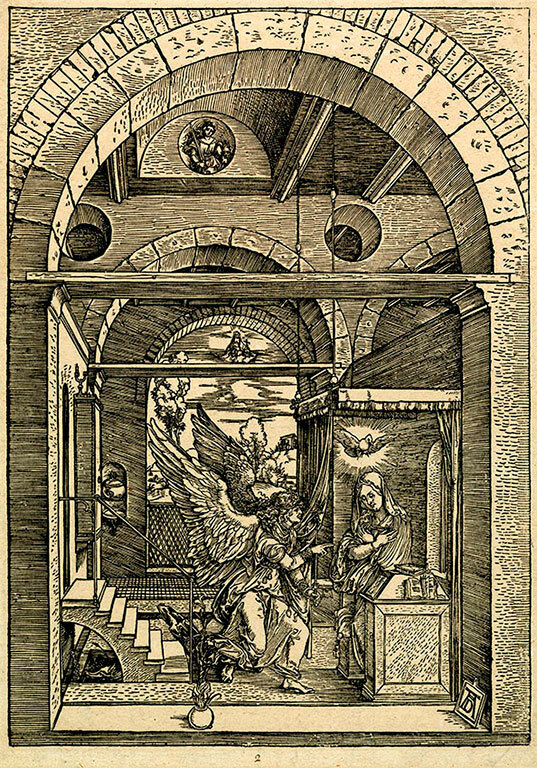 Add to this that, again, we have another two miniatures directly influenced by Dürer's work, the prints depicting St Jerome in his Study and the Annunciation, from the Life of the Virgin series (Fig.5d and Fig.5e). Once more, in both cases, while the source is completely unambiguous, the illuminator uses it creatively, to stress a point or another. While, for instance, the rooms feel considerably smaller in the miniatures, the artist did nevertheless experiment with perspective to create an illusion of three-dimensional space. In doing this, like in Dürer's prints, the artist also foreshortens the image in terms of depth, thus achieving a very subtle but important effect: it positions the viewer closer to the pictures and at a touching distance from a sacred space. The miniatures in the Lectionaries and the Hatfield manuscript clearly echoe the style of Gerard Horenbout. 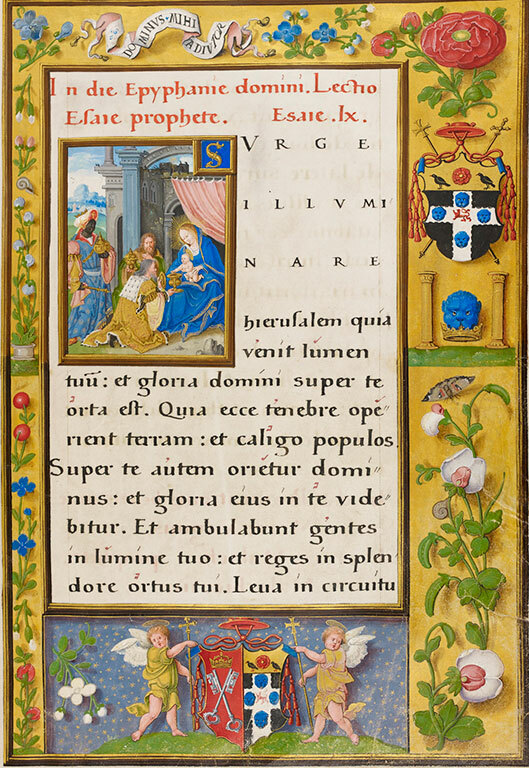 The illuminations for the Visitation and the Presentation in the Temple in the Wolsey manuscripts and the Horenbout's Sforza Hours are eloquent examples of proximity in terms of composition and colour range. It is the differences though that are more telling and these point to a different hand, trained by the same master. Lucas possibly. Or perhaps Susanna, whose talent so impressed Dürer that he purchased a drawing and wrote about her in his Diary. The format of these manuscripts is closely tied to their genre. As lectionaries, containing selected readings from the Epistles and Gospels, they were designed to be read at the pulpit, and, as such, they were bound in separate volumes, usually large and richly decorated books suited to use in candlelit cathedrals. 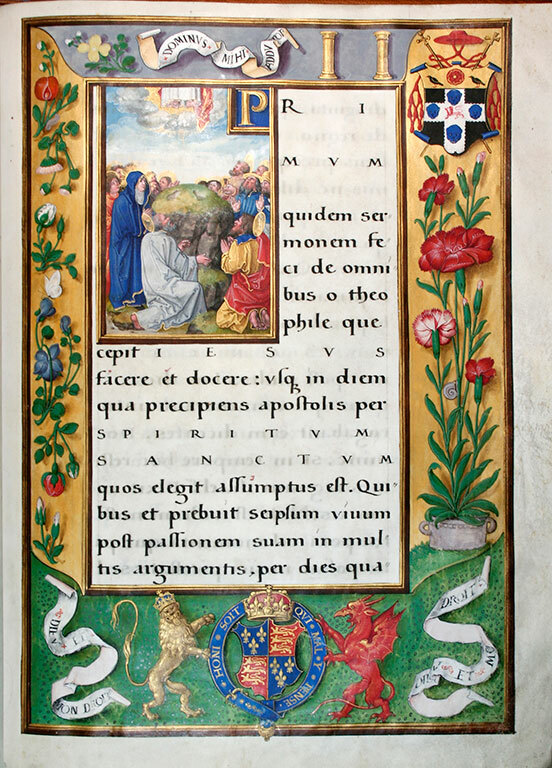 In the case of the Wolsey Lectionaries we don't know the nature of the precise interaction between the one who commissioned the manuscripts, the calligrapher and the artist involved in the design and decoration. Did they work together closely? Were the books assembled in quick succession? Or did they develop in a gradual symbiosis? One thing we can be certain of is that they were designed in such a way so that one could absorb text and images at a glance. It is not unimportant that the volumes were written in humanistic bookhand and that their general design suggests not only a clear rooting in the Flemish tradition, but also a firm knowledge of Dürer's work. Taken as a whole, the Lectionary was, of course, intended as a devotional book and the red scorings in the texts to guide oral reading suggest that the manuscript was actually used. All this is straightforward. However, if one looks carefully, allowing the splendour of the decoration and calligraphy to get hold of us, the grasp also reveals that, as viewers, we are in a very privileged position being shown the way to a sacred space. On a subtle level, the manuscript was programmed to engage the reader, to grant us a perhaps unexpected independence from the church, inviting private devotion through what is essentially a humanist aesthetic. This suggests a greater intimacy between the work and the one who commissioned it, Thomas Wolsey. And we are back full circle. It is beyond doubt, these were very special volumes and, one assumes, nothing but perfection would do for Wolsey. Largely true, up to almost the end, with both volumes mirroring each other masterfully. However, one is bound to notice a series of inconsistencies and faults between the Relics Sunday and feast of All Saints. In the Gospel Lectionary, the miniature for Relics Sunday mirrors the image chosen for the feast of All Saints in the Epistolary, and the reading from Matthew 5 is different from the canonic Luke 6, 17-23, quoted in the Missal. Also, the feast dedicated to the Nativity of the Virgin is only given a few lines in comparison to the way it appears in the companion volume. In the Epistolary, the Translation of St Cuthbert (on 4 September) is placed after the Nativity of the Virgin (on 8 September), the feast dedicated to the Translation of St Frideswide to mirror the one in the Gospel Lectionary is missing. Worse still, the place where it should have appeared is occupied, in the Epistolary, by three blank folios. More, the whole work at this point seems to have been left in suspension, with Wolsey's arms at the bottom of fol.38r and the two lines initial on fol.38v looking rather less carefully painted. Indeed, if we zoom in and compare the way the arms on the previous page was painted, with all the gilding and the trompe d'oil firmly in place, the former seems distinctly unfinished. As if the artist abandoned it over night. All this is intensely disconcerting and raises yet more questions. Of course, one may link the inconsistencies and errors in the production of the suddenly orphaned manuscripts with Wolsey's abrupt fall from grace. One could even explain the difficulties in locating the original binding, to fit the splendour of the pages within. At least in the case of the Epistolary, it is possible that due to its unfinished state, the volume never benefited from a sumptuous binding to start with. We could continue trying to answer the ever more numerous questions arising. Some answers would be right, others would be corrected as a result of further research and discoveries. The fascinating thing about these manuscripts is that we now know that we will never have all the answers. We also see that the more closely we scrutinize them, the more we allow ourselves be lured to enter the dialogue they invite, the more we understand not only how they work and why they are the way they are, but also, more importantly, we discover that we can trust them lift so many veils off our own eyes6.